What you don't know about the human factors of usability can cost you money or even kill somebody (maybe you)!" Tom Hewett of Drexel University (Philadelphia) presented in the Namahn library reasons why it is important to take into account human performance characteristics in designing complex systems for human use. 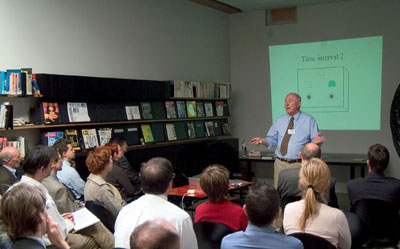 Hewett captured the audience’s attention with his description of how limitations in human cognition resulted in several spectacular and tragic airplane crashes. The crashes were not attributable to mechanical failure, weather conditions or even any clearly identifiable pilot error. Rather they were the result of a common failure to accurately gauge distance when confronted with a featureless landscape. They were, namely, a problem of human cognition. Hewett also showed how motion makes it easier to visualize 3-D objects and how the ‘magical number seven’ is a rule that is often applied inappropriately.